The Pearl Chamber of Commerce held a grand opening and ribbon cutting ceremony on Thursday, May 26 at red river specialties located at 5221 Highway 80 East in Pearl. Red River has been in the area for over 20 years and is the premier provider of herbicides specializing in range, pasture, agriculture and forestry markets. Whatever your need may be, their team of experts will assist you with customer service that will exceed your expectations. Red River has support from quality manufacturers such as Dow, BASF, Monsato and Bayer. They are open Monday through Friday 8 AM until 5 PM. Shown cutting the ribbon is Clint Andrews. The Pearl Chamber of Commerce Business of the Month in April is Sonic Drive In. Sonic has two locations in Pearl: 3539 Hwy 80 East and 141 S Pearson Road. The Hwy 80 location is one of the oldest Sonics in this part of the State, built in 1974. Rob Goodwin is the GM and he has 4 Assistant Managers and 30 employees. Jack Brown is the Pearson Road GM and has 5 Assistant Managers and 40 employees. The District Supervisor of both Sonic Drive Ins in Pearl is Chris Ransom. Both locations have a booming business and have recently set new monthly net sales records. Customers love Sonic’s extensive menu of burgers, hot dogs, tater tots and chicken sandwiches, but they also love Sonic’s Breakfast Menu with the Morning Drink Stop, which is any Large Soft Drink or Slush for 99 cents from open until 10:00 a.m. Sonic is also very well known for their “Happy Hour” from 2 – 4 p.m. 7 days a week, which is ½ price on all drinks and slushes. Both Sonics are about to add digital boards for ordering, new computers and other upgrades that will make their already good service even faster. The Pearl Chamber of Commerce Business of the Month in March is Fowler Chiropractic, located at 5230 Hwy 80 East in Pearl. Fowler Chiropractic is owned and operated by Dr. Chris Fowler and his wife Dr. Lynn Fowler. They are well known for their family friendly practice and their sincere desire to take away your pain. They are the only chiropractors in the Central Mississippi area with a Pro-Adjuster, a computerized machine that allows them to adjust without manual force or twisting and turning your spine. This highly sophisticated technology is just one of the many sought after services that they offer. Fowler also offers deep tissue laser treatments that remove painful inflammation, a Back on Trac mechanical traction chair that provides gentle traction and decompression therapy and E-Stim therapy to help relax your aching muscles. Fowler also offers services for children and pregnant women. Fowler Chiropractic accepts all major insurance plans and you do not need a physician referral. For more information call 601-932-1070, visit their website at drchrisfowler.com or “Like” their Facebook Page that is always full of interesting and very helpful information. We are pleased to announce that Bouquets of Pearl was chosen as the Pearl Chamber of Commerce Business of the Month in January. They are located at 433 N. Bierdeman Road in the Heart of Pearl Shopping Center. The owner, Pam Powell is an FTD Master Florist and has been a florist for 39 years. She got her start at Greenbrook Flowers where she worked for many years and then was at Lady Bug Florist for 15 years. Bouquets of Pearl is a member of the popular wire services Teleflora and Bloomnet and is also the floral provider for the gift shop at St. Dominic’s Hospital. They have a very unique line of “The Two of Us Pottery” that is made in Mississippi and they also have a good variety of Yankee Candles, stuffed animals and great items for gift baskets. Bouquets specializes in flowers for funerals, weddings, birthday, Valentine’s Day or any special occasion. They deliver anywhere in the Metro area and go to all area hospitals and funeral homes. For more information call 601-933-0029. Pictured is Pearl Mayor Brad Rogers, Bouquets owner Pam Powell and Floral Designer Barbara Reeves. Not pictured is delivery driver Janie Mann. 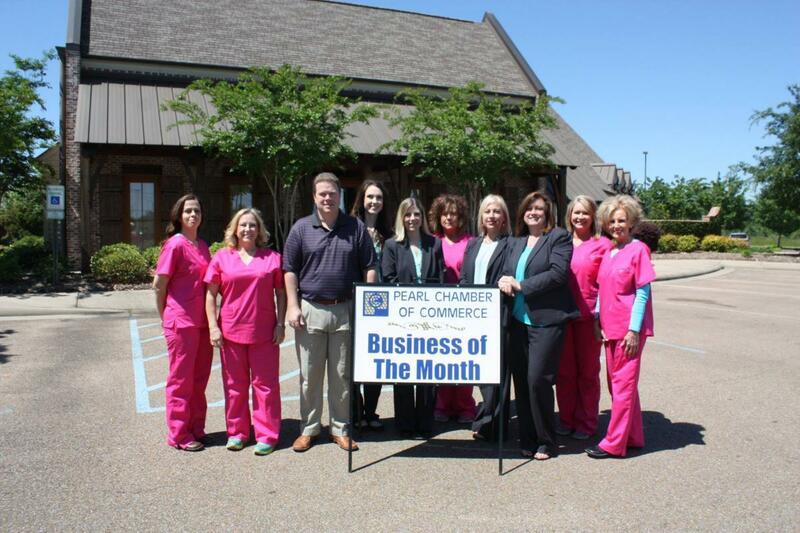 MedScreens Inc. was selected as the Pearl Chamber of Commerce November Business of the Month. They are located at 3825 Hwy 80 East in Pearl and locally owned and operated by Karen and Mike Crawford. MedScreens is an active community partner and they are a proud sponsor of the Police and Firefighter of the Month Awards. MedScreens performs services such as drug, alcohol, DNA and paternity testing for companies and individuals as well as courts, attorneys, state and county agencies and private investigators. MedScreens offers both in house services as well as mobile services. For more information call 601-939-3030. The Justin Null Alfa Insurance Agency opened in Pearl in 2011 at 3823 Hwy 80 East at College Crossing, located near Hinds Community College. Justin is very involved in the community and is an active chamber member as well as being a corporate sponsor for Pearl High School Football. Alfa Insurance offers a wide variety of insurance plans including those that most other insurance companies won’t insure such as log cabin homes, homes that are over 5 miles from a fire station, high risk customers with a poor driving record, a large claim history or DUI convictions. The name Alfa came from their origin, which was the Alabama Farmer’s Association. They insure animals and farm equipment such as cows, horses and tractors. They also offer church insurance, mobile home insurance and renter’s insurance. Alfa is also a broker for other companies and will shop for the best coverage for their clients. For more information contact Justin Null at 601-487-6714.